First you grow the celery. Sorry, store bought celery just doesn't cut it. It's like home-grown tomatoes versus the kind you get from a local chain grocery store. They just taste better. Even so, if you can't get celery fresh from the garden, buy it in season, from as close to home as you can to make this great soup! Thoroughly rinse and drain chopped celery. In a large pot, warm up the oil and add celery, onion, thyme, salt & pepper and saute until the celery is bright green and getting soft. Add the wine and cook a few minutes until wine is mostly evaporated. Add the broth & potatoes and heat to boiling over high heat. Reduce heat to simmer until the potatoes are very tender. At this point, I used my hand blender to blend the soup, and then put it through the cone colander with wooden pestle, to take out all the coarse bits. Reheat the soup carefully. 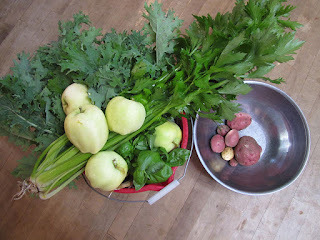 I can't grow celery but I do have celeriac, maybe that and some parsley would taste similar?